Oh my goodness! If you haven’t tried All About Spelling yet you are soooo missing out! We started using this product last year and absolutely love love love it! I personally think they should have named it All About Phonics because it really is a phonics, spelling and reading program in my opinion. I wrote a review of it awhile back you can read my All About Spelling Review here. I was previously using a different spelling program and my daughter was getting 100% on all her tests. I thought she was doing great until I realized that she was actually just memorizing her list for the week, but then later when asked to recall a word she should have learned it was long gone. With All About Spelling, kids learn why words are spelled as they are. They drill the phonics rules until they are mastered and that is what has made the difference for us. I noticed a marked improvement in both the reading and writing skills of my children after starting this program. Now when they go to spell or sound out a word, I’ll remind them of the rules they’ve learned and they are able to figure it out on their own. The lesson plans are well laid out and actually scripted for you if you like that. They also include hands on activities to make it a little more fun. I have a few Spelling Practice Ideas on my blog as well if you’re looking for more ideas to make spelling more hands-on and fun. If you haven’t yet, make sure to visit All About Spelling: Don’t forget to let them know Erica @ Confessions sent you over! I’ve had a lot of people ask for a giveaway from All About Spelling, so I contacted Marie Rippel and she was totally on board! 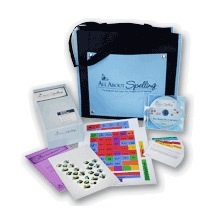 So…drum roll please….I’m doing a giveaway for a FREE All About Spelling Level 1 plus the Deluxe Interactive kit! Simply leave a comment below letting me know why you’d like to win a free copy of All About Spelling Level 1 plus the Deluxe Interactive kit! The give away will be open until midnight EST Friday September 2, 2011. Winner will be announced by Sunday September 4, 2011. Disclosure: All About Spelling provided me with a free copy of their product to offer as giveaway on my blog. The opinions I have given are mine and may differ from others but were not influenced by the company or the free product provided. Thanks to your earlier review, I have already tried All about spelling with my oldest, but would an additional set for my younger two to share! Thank you for this post and your helpful blog! I would love towi. This for my son and daughter. My son struggles with phonics and is a very kinesthetic learner. I think this would be great! Thanks! This is our first year home schooling. I have read the reviews of this program and would love to try it out this year! I have tried building spelling skills, copywork, and sequential spelling- By the sounds of it, I need this spelling program the others are not working for us. This one looks so fun! I have used this product before and I love it. I had level 1 a few years ago for my son who is now in a higher level, but I now have 2 other children who will need to use the program in the next few years. I would love to be able to offer them the same great program. I love ALL ABOUT SPELLING. It made such a difference in spelling skills for my oldest child. Thanks to Erica & Marie for this AWESOME giveaway!!! Hi! Would love to win your giveaway. Haven’t started homeschooling but am working with my pre-K kids. We would love to win this! It is our first year homeschooling and I think the focus on phonics could really help my daughter. I would love this set! I have always wanted to try it, but I have never had enough in my homeschool budget! Ive heard great feed back about the program. This is our first tear home schooling. My daughter is 9 and has health issues whiched caused her to miss a lot of school. The school was horrible during this time and now we are going to try home schooling. There’s so much to learn. All about spelling is on my wish list as I’ve meet a lot of home schoolers using it. I would so love to win this!! My daughter is in pre-k but I’m gathering materials for the long homeschooling road ahead! I’m often at a loss how to help my son with his spelling beyond rote memory, which as you said, is not often of lasting value. This program sounds terrific! I’ve tweeted about this giveaway! I subscribe to you via RSS! I would like to win this because I’m new at this whole home-educating thing; all the decisions involved in getting started can be overwhelming, and having something in hand is one less decision to make. I’m trying to decide between this product and Sequential Spelling for next year. I would sure like to try this product. I have been homeschooling for twenty years. I have two graduates, a senior, a sophomore and a six and four year old. Some of my older children really struggled with spelling. I tried many different programs and never really found one that I liked. I’d like to start off my younger two children with a better foundation than I gave my older ones.